Use these quality mediums for your leafing projects. 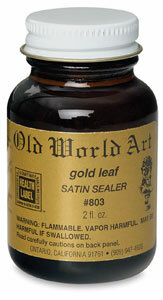 Satin Sealer — A clear satin finish sealer designed to protect the leafing from wear and tarnishing. Brush on evenly and allow to dry. Clean up with mineral spirits. ™ Old World Art is a trademark.